Lender requirements will vary, but FHA program rules allow a borrower to refinance an ARM loan to another ARM loan. A strategy some may use to keep a lower mortgage loan interest rate but stick with a plan to sell the home at a later date rather than keeping the house for the lifetime of the mortgage. January 22, 2019 - Are you thinking about refinancing your home loan with an FHA mortgage in 2019? There are several good reasons why home owners are looking at their FHA refinance loan options in the new year. If any of these sound familiar to you, now may be a good time to discuss your FHA refinance loan needs with a participating FHA lender. The borrower coming into 2019 with an adjustable rate mortgage loan won’t like the idea of rising interest rates, which were a trend in 2018, possibly coinciding with the end of an Adjustable Rate Mortgage (ARM) teaser rate period. Borrowers who have conventional, FHA, or other government-backed non-FHA mortgages with adjustable rates should consider refinancing into an FHA loan with a fixed interest rate. Why wonder about interest rate trends when you can lock in a rate that will remain the same over the lifetime of the mortgage? Lender requirements will vary, but FHA program rules allow a borrower to refinance an ARM loan to another ARM loan; a strategy some may use to keep a lower mortgage loan interest rate but stick with a plan to sell the home at a later date rather than keeping the house for the lifetime of the mortgage. If you are not as concerned with long-term benefits of a fixed rate mortgage (which would be true for borrowers who don’t plan to keep the home but sell and move on at some point) an ARM-to-ARM FHA refinance loan makes sense. Those with existing FHA mortgages can refinance using an FHA Streamline loan which requires some tangible benefit to the borrower including a lower mortgage loan interest rate, a lower monthly payment, or getting into a fixed rate loan from an ARM loan. FHA Streamline Refinance loans cannot be used for non-FHA mortgages, unlike FHA Simple Refinance, FHA Cash-Out Refinance, etc. But for those who do hold an FHA mortgage, the option can be quite useful. Shop around for a new refinance loan and compare options, rates, and requirements. 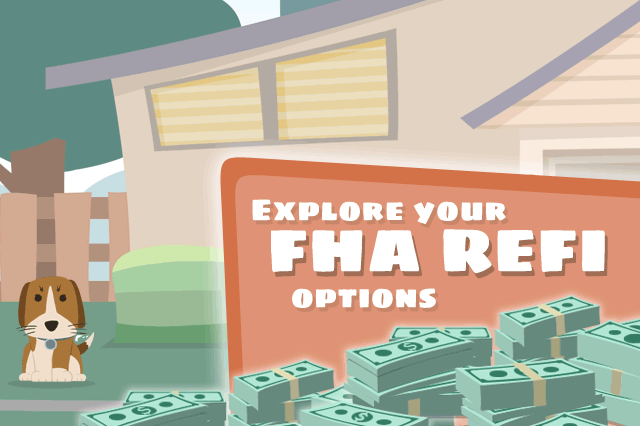 You may be surprised at your options with an FHA refi loan in 2019-talk to a loan officer about your goals for the new loan to see which of the many FHA refinance options are right for your needs.